It is some weeks ago that we travelled along the West Coast of Norway on the Hurtigruten. We started in Bergen and ended up in Tromsø. The journey took five days and it was a very relaxing and enjoyable trip. The landscape is nothing short of spectacular and it was a feast for the eyes. 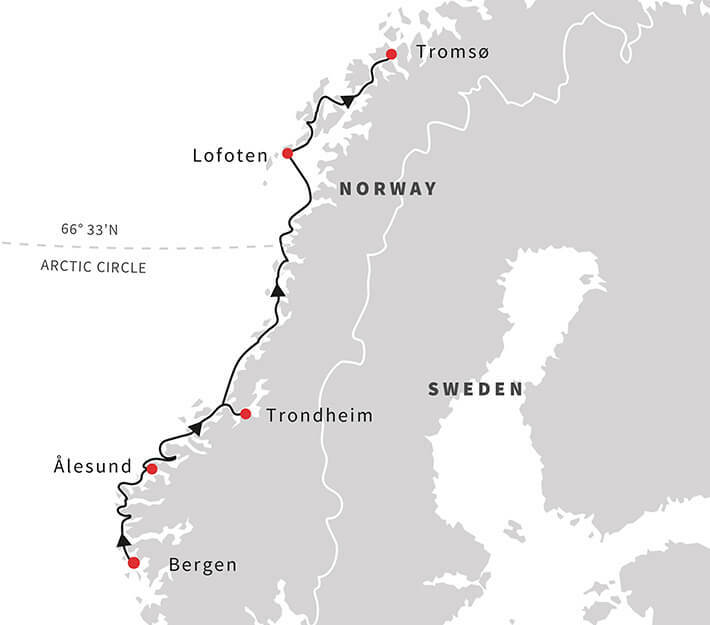 This is a map from the Hurtigruten website. So, back to the landscape and its wondrous beauty – here is a sample. Nidaros Cathedral (Norwegian: Nidarosdomen / Nidaros Domkirke) is a Church of Norway cathedral located in the city of Trondheim in Sør-Trøndelag county, Norway. Built over the burial site of Saint Olav, the king of Norway in the 11th century, who became the patron saint of the nation. It is the traditional location for the consecration of the King of Norway. It was built from 1070 to 1300, and designated as the cathedral for the Diocese of Nidaros in 1152. After the Protestant Reformation, it was taken from the Roman Catholics by the Lutheran Church in 1537. It is the northernmost medieval cathedral in the world.